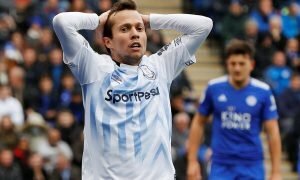 3 players Everton should cash in on during the January transfer window | The Transfer Tavern | Where football transfer rumours fly or die! The Everton supporting punters here in the Transfer Tavern are hoping for an upturn in fortunes during the second half of the campaign, after an alright start to the season. The club lie in 11th position in the Premier League but are the division’s draw specialists, having taken a share of the spoils on ten occasions so far during the campaign. Boss Roberto Martinez has got the side playing some decent football, but his squad is likely to see some changes both incoming and outgoing during the January transfer window. Three Toffees supporters are waiting at the bar to order food and start to discuss which players are surplus to requirements for the Goodison Park-based outfit.